I use Circus Ponies Notebook for my notes on topics, resulting in Topic Notebooks which are inherently hierarchical: Sections, Pages, Cells in an Outliner — there is a strong structure in place. That can be very helpful to find what you are looking for, but it also poses problems if you want to work in a more networked, non-linear style, without a clear structure (at least in the beginning). One old-school way of working in a more non-hierarchical way is the “Zettelkasten” by Niklas Luhmann. Luhmann, a prolific author, did write his notes on index cards and used a system with references to other index cards to organize his creative work (an interesting video is on YouTube, unfortunately in German). Personally I wonder regarding the time distribution between working with the content and working to keep the system alive, but the system is impressive. Today, there are digital systems which provide similar functionality. The probably best-known are Wikis, but there are also dedicated programs that strive to provide the same functionality, for example, the “Zettelkasten” (did not try it out, but seems to be a German product). Okay, no screen captures before the first coffee — and that Latte is a serious disappointment, too chunky — anyway. Like written below, the # do not make sense and you probably cannot see the field for the tags at the bottom of the screen. Given that I did not put the files into a folder (group in DEVONthink), you have to click the area below the smart folders to show them (they are not in the Inbox). Using the Icon which you can put into the task bar of DEVONthink), use the three panes view to quickly enter the text in the field below. RTF files allow for links, images, and the usual formatting, yet are still quick and easy to use. Select View – Show Tags to get the tag bar below the entry. Enter the tags. DEVONthink supports auto-completion. Press enter after each tag, otherwise you get a different tag (“,” does not separate tags, see video). You can see the tags by using the icons on the left side (you can use this tag list to tag entries, just drag and drop the file on the tag). You can “Copy Item Link”s and insert them into files where you want to create a link to another file. Note that the links themselves are references to a file in DEVONthink (e.g., x-devonthink-item://12225501-BB79-4904-8E0B-AD2C6491B316). This means they will work if you change the file name and you can also change the text of the reference, but you lose your links if you quit using DEVONthink. This means you should probably use the file names as link text or make very sure that you never quit using DEVONthink. Literature notes are worse than worthless if you do not have the source information. Given that the notes in a file will probably include more than one piece of information, you can simply copy and paste them where you need them. I strongly recommend using a standard format like authorname_(authorname_…)year. DEVONthink’s search function allows you to search for file names or content (and a lot more). However, using “tags” in the text like #apple# won’t work, DEVONthink seems to ignore the # which would differentiate a deliberately given text-tag from the normal occurrence of the word. If you want to use tags, use DEVONthink’s tags or make sure that the words you use are unique (like that author_year reference). Personally, I would store the literature in a reference manager, but you can also put the literature in this or another database. Note that if you put it in the same database, DEVONthink will include it in the “see also” results. In both cases you can copy the item link and directly refer to the files this way. Note that “source_4” is just an example, like “Aspect 1” etc. If you’d use it, there would be something like “miller_1992” or the like. DEVONthink allows you to quickly move back like the back and forwards button in a browser. Just use the triangle-arrows above the content field. DEVONthink has it’s own AI and analyzes the entries. You can use the “See also” function by clicking on the Wizard’s Hat in the bar above the file window. It will show you similar files. But that’s it for now, if you are working this way I’d be very interested in a few comments — what works for you, what does not, what did change over time, etc. 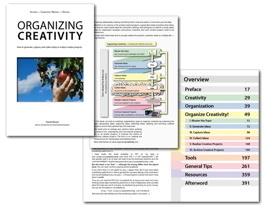 Perhaps I will play around with this way of organizing creativity for a while. My general idea collection (non-work related) is not that hierarchical and it might benefit from a few of the tips here. Hi Daniel, nice to see that my questions around your use of circus ponies notebook and comparing its potential uses with the Zettelkasten program by Daniel Lüdecke prompted you to take yet another approach. I have just now started reading Christian Tietze’s post http://christiantietze.de/posts/2013/09/create-zettel-from-reading-notes/ which also seems to offer a possible alternative. I am still making up my mind about how I want to use various tools in a workflow. I am looking forward to the discussions. I think it is a little bit more difficult to adopt Luhmann’s Zettelkasten system with DevonThink, because the core principle of Luhmann’s Zettelkasten was not to use (automatic) crossreferences (tagging), but the continuation and branching of an idea/argumentation/excerpt (“innere Verweisungsfähgikeit). That’s where Luhmann’s famous numeration of card files is used for. With this technique, you can start with an idea or keyword, retrieve related cards and then start following a “path” and choose certain branches, depending on how you want to develop your argumentation (coming from “Picasso” to “museum” or to “cubism” and so on). I have written (German) blog post (http://strengejacke.wordpress.com/2013/08/30/arbeiten-mit-elektronischen-zettelkasten), which in short describes the principle of Luhmann’s Zettelkasten and how I tried to adopt this in the electronic version. It makes sense to read the discussion as well, where more details are provided. You can use links to other files, one or multiple files, like links in a Wiki entry — which you can then follow like hyperlinks. Isn’t the last usage pretty much like numerating the cards and linking to these cards? Or is there something missing? Thank you Daniel for this post. Very inspiring. It is also worth mentioning SlipBox for Mac and iPad http://tabi-software.com/slipbox/, which is a lighter version of Zettelkasten http://zettelkasten.danielluedecke.de, but a version for iOS is impressive. Powerful solution of this type is also Tinderbox, even though this is not exactly the Luhmann Way :-). 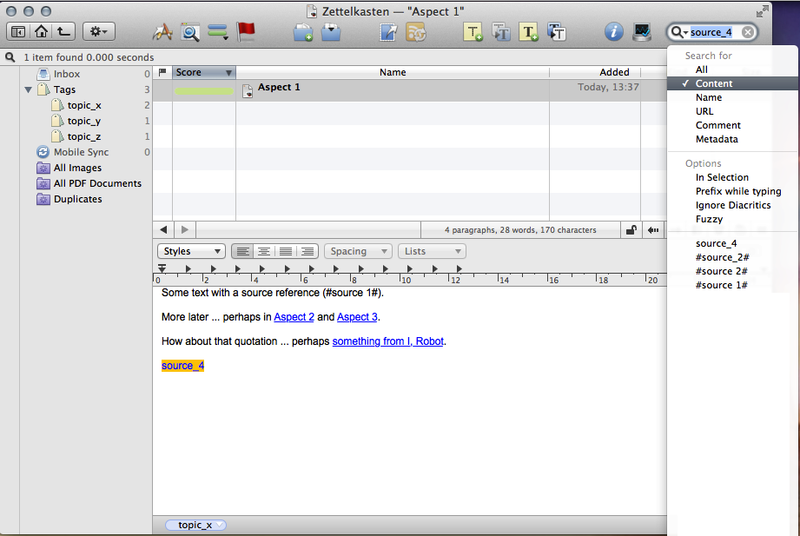 Tinderbox allows to present the relationships between notes in a mind map, outline, tree, etc. For now, I’m trying to adapt DEVONthik. I will report once I have gained more experience in working with these tools. I think there’s a difference between a) tags/keywords, b) manual cross-references/links and c) “trailing entries” or the continuation of entries. Luhmann used all three, but if I understood right, the most important thing to let creativity and productivity emerge was point c). at a) I do a keyword search for “Picasso” which gives for instance 100 entries as results that all have this keyword. If I want to go further (“surf through the entries”) I could filter these search results by another keyword, e.g. “cubism”. This would result in entries that have both keywords “Picasso” and “cubism” (!). Problem: You stay inside your topics (Picasso and cubism) and can’t “break out” of this corset, so you won’t link any new ideas that were not supposed to be linked. at b) I do a keyword search for “Picasso”, find 100 entries and, let’s say, the fifth entry has a cross-reference/link to another entry nr. 102 that is not in the search results and thus has neither the keyword “Picasso” nor “cubism”. It is important to have this cross-reference/link, otherwise you could not “surf out of your search results”, i.e. coming from “Picasso” to other entries that don’t have this keyword. Problem: With a certain amount of entries you cannot remember everything. If you add new entries, do you know whether any and if yes, which of the existing entries should have cross-references/links to the new added entry, if they don’t share the (or a) same keywords? at c) You have read something about cubism. You do a keyword search on “Picasso”, examine the result list and decide on which existing entry could be the start of a “story” where the new entry can be appended. So you decide to continue Zettel 50 (with keyword “Picasso”) and add entry 103 as “trailing entry” or “continuation” and assign the keywords “Picasso” and “cubism” to it). Next you read something about museums and think it fits to at a new entry as “trailing entry” to entry 103. But, the entry does not necessarily need the keywords “Picasso” or “cubism”. What you now have, is a starting point of a “story” or “text” dealing with Picasso, and you can follow the path over “cubism” to “museum” for instance. Or you probably have another entry 104 that branches from “cubism” (Zettel 50) into another topi. Now you have a relation between entries that don’t need to share same keywords but are still connected, and you can put the different branches into relation. What is the difference between Picasso’s cubism in museums compared to Picasso pictures as “degenerated art” and so on. In case c) you don’t have to remember the entries that need cross-references/links, because you continue a “story”, where the storyline could follow a certain branch or open new paths etc. So you have an emerging network of related thoughts. Well, it’s a little bit difficult to describe in English, but I hope I could make clear the (in my perception) difference between a) keywords, b) cross-references and c) trailing entries (don’t have a better term for that, unfortunately). @Daniel your last comment is an excellent explanation of how to digitally implement Luhmann’s method. thank you very much! I am looking for good ways to do research for my PhD thesis.I have just downloaded the program Citavi. Is it a good one to implement the system you mentioned? Citavi is made in Swiss. Good question — I know that Citavi offers more functions than most reference managers, among others ways to handle the information contained in the articles. Personally, I favor solutions which do not depend on a single, large storage. Given that I haven’t worked with it (long term!) I can neither recommend for nor against using it. My advice would be to simply try it out, perhaps have a look around for blogs which provide tips for using it. 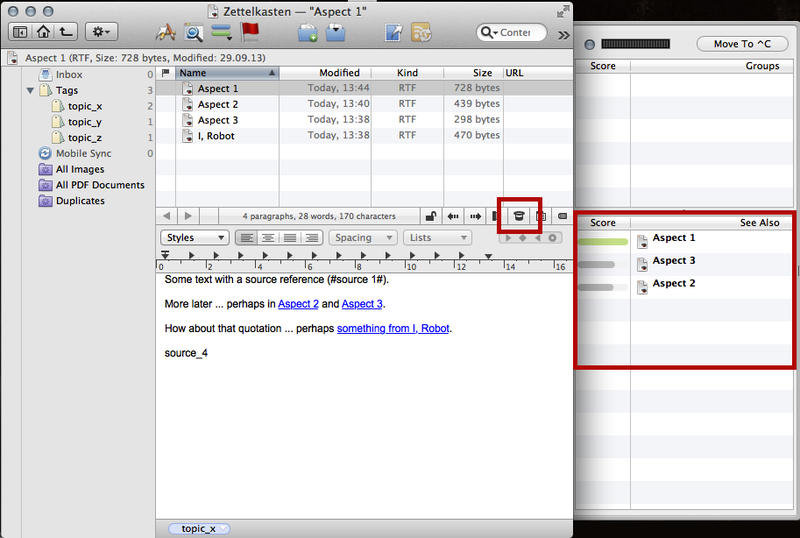 Make sure you can easily export your data (articles and notes) and re-evaluate the way you work after the first year. You’ll probably know what you need then. BTW, if you main storage is a reference manager I would suggest using a simple folder-structure and documents named authorname_authorname_…_year (with a, b, c if multiple papers by same authors in same year) as a first storage. You will find a lot more articles than you’ll actually read/work with, and putting them all in a reference manager quickly becomes tedious and clogs up the manager. corresponding thoughts.I will be using Citavi for this now. 5 Write the first draft with the outlines. To achieve above,I think, an ideal solution includes a relative flat structure of folders with sources(PDFs,etc) and notes(plain text based) in it and an engine with functions such as indexing ,deep search and tag/keyword/cross-reference system. Hoi Charlie, sounds about right, although a thesis is an individual process and you have to find something that fits you and the area you are working in. In the course of a couple of years, you will likely change a few things, so keeping your material flexible is a plus (easy with digital notes). Perhaps the most important thing beyond keeping an overview of what you have read and making sense of your notes: Always making sure you jot down the source of the notes you are making. Not only to look things up if you forget the context, but also to cite it correctly. Even if your supervisor doesn’t care or find it, give it ten to twenty years and someone at Google (or its successors) will press a button and all plagiarism will be highlighted, accidental or not. In any case, good luck. And remember, you have to be able to work with it, that’s the criteria. There is something shockingly amazing at what happens doing phrase and keyword searches in DevonThink Pro. I find all kinds of cool ideas and quotes and relationships that I was not consciously looking for or thinking about. Even so, I am attempting to put as much as possible onto index cards and do my best attempt at a Zettelkasten physical system. There is something satisfying to me about having to pick up, read and review non-digital information. And the act of doing so, I hope, will force me to consider what I have written and make the connections on my own and create knowledge which is longer lasting and usable to myself. Somehow, my digital writings have gotten nebulous and are easy to forget. But that could just be a personal problem from having too much info, databases and bad habits from interrupting myself with blogs, email, internet surfing etc. Yeah, I know what you mean. Digital is great for quick access, for searching, for serendipity, and for collecting all the necessary information in one place. 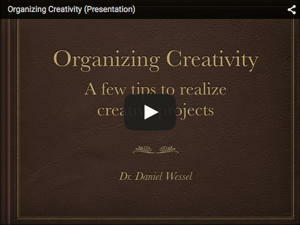 Creating outlines with the information and working with the outlines — it’s just great. But I also did notice that remembering is really hard, one reason why I would still go for handwritten scripts if I were to memorize lots of information. And yeah, might be the distractions, might be the much, much higher writing speed (really slow handwriting, typing is much faster), might be something else (training?). Still, digital is great if you use it as an external memory and then as visual sketchpad (outlines, mind maps) — despite being more ephemeral. Thanks for your feedback Daniel. I just now watched your video. Did you continue with the (#source#) type of internal tagging? I had never seen that before. I like the idea. Does the # means something to DTPO ? Or could it be any type of character or string? Now that I am actively creating a physical (4×6 index card) Zetellkasten system, I am wondering, how or if to integrate it with my already extensive (huge might be a better word) DTPO databases. no, it was only an example of using DT as a “Zettelkasten”. Personally, I use the tagging system of DT for tags (and use them sparingly, mostly for sources like fiction and non-fiction literature). It was a proof of concept — and if I would use text tags, then I would use #…# to find only the tags, not other cases in which the word was used. Regarding your other question — the problem would either be linking the cards to DT and back, or how to import them in a useful format. Of course, simply scanning them (document scanner) might work, but you couldn’t continue to use them. Unless, of course, software like Evernote can recognize the handwriting (never tried it) or you add notes and the like to the cards. But personally I’d wonder why you’d want to integrate it for anything else than backup and mobile availability. As long as the system works there is no need to change anything. Hi Daniel, this is an old thread but I hope you’re still checking it. It’s all good and I’m completely persuaded that Devonthink can take the organization of information to a new level. There is a simple problem I just haven’t been able to resolve, and I’d love to know what you think about it. The problem is that most of the time, I love to write my notes by hand; a second issue is that I’m not consistent and occasionally I do write notes directly in Devon. I believe that scanning, tagging and cross-reference might be part of the answer. But also perhaps the kind of hand-written notes one takes should somehow contemplate it’s later inclusion into the database. Without knowing the details of the situation, I’d recommend bringing your notes to an uniform standard, here: all digital. I do handwritten notes too, but (eventually) they end up as digital text. It’s searchable, takes less storage, can easily be moved from app to app, etc. pp. I just have a group/folder in DT for handwritten notes (hello document scanner/scanner app) and type what I have written by hand. Essentially I recommend using some kind of inbox you empty regularly (never go into drawer with lots of hard-to-read notes territory).